Lace and loops combined with a soft and luxurious yarn make for a delicate and feminine cowl. The simple lace pattern is repeated four times and then the I-cord loops are added around the edge. Four buttons finish the cowl and are secured with some of the I-cord loops. The alpaca, silk, and cashmere yarn is perfect for wearing next to the skin. 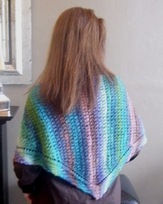 This is a quick and interesting knit and would make a terrific gift! A couple of the testers decided to knit the I-cord in a contrasting color and the results are stunning. Check them out on the Ravelry pattern page here.